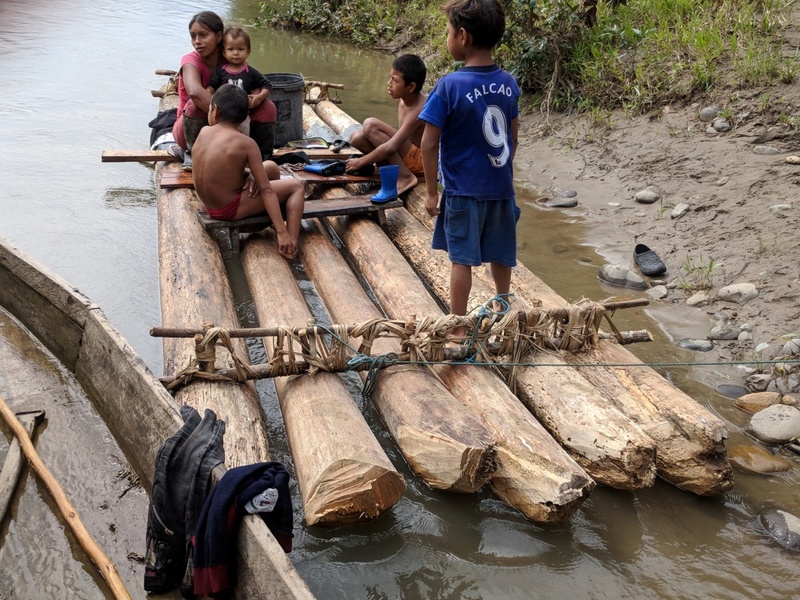 While investigating logboats in the Rio Napo drainage in Ecuador in June, I observed six log rafts within a few kilometers of each other – and no others elsewhere in the same drainage. I do not know if this clustering of rafts was particular to a limited area or if further investigation would reveal more widespread usage. According to my guide and one other informant – a woman on a raft with her children on the Rio Arajuno, a tributary of the Napo – the rafts serve four or five functions. 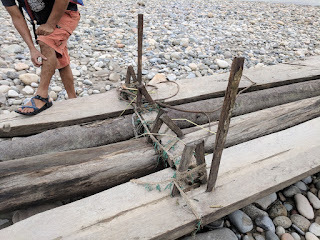 When observed, the woman's raft was tied to the shore and she was using it as a stationary platform on which to do her family’s laundry, the river bank near her home being too steep and muddy to allow her to do it directly on the shore. 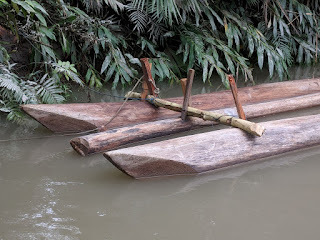 She indicated that she also uses rafts to cross the river (the reason for which is unclear) and to deliver her farm’s produce downstream to the nearest road crossing, where it is picked up by a truck for transport and sale in the nearest market town. The downstream trip with produce is a one-way excursion, there being no practical method to bring the raft back upstream. 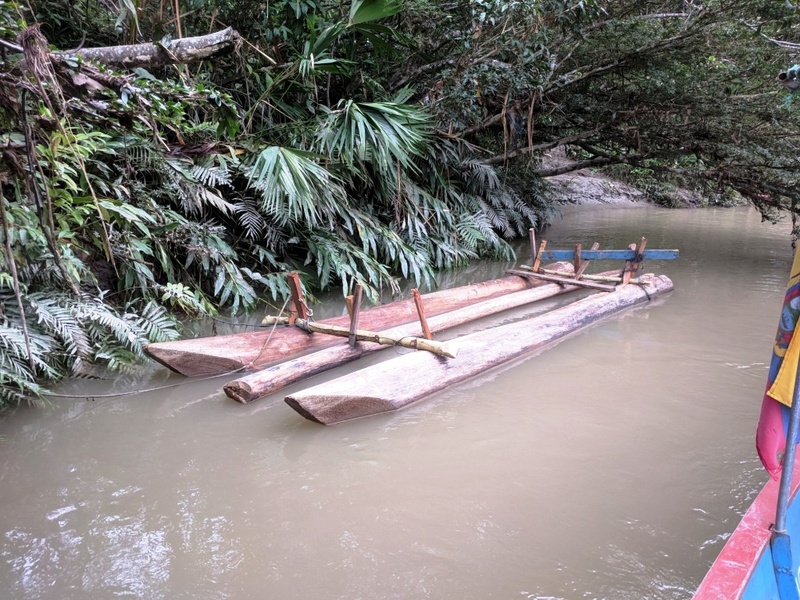 At least some of the time, therefore, the raft itself may be sold for its logs at the end of the voyage. 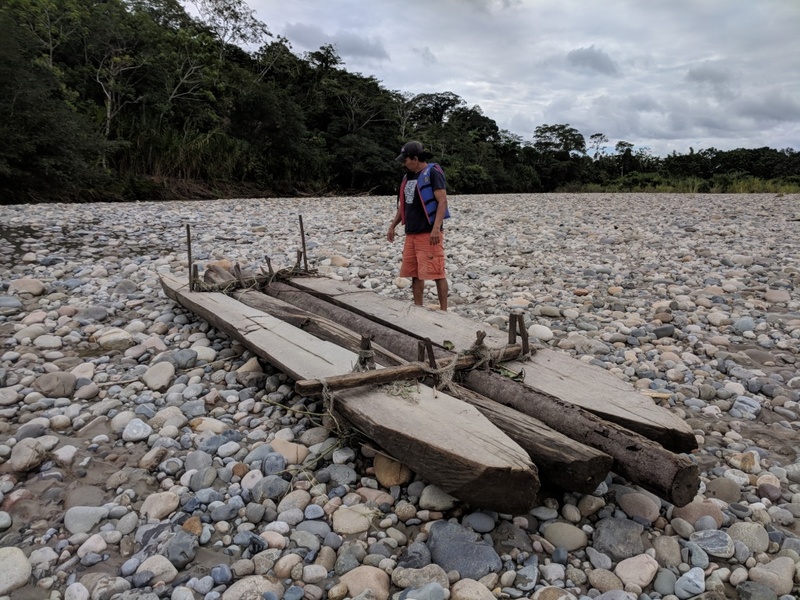 According to my guide, rafts are also built by some of the numerous "jungle lodges" in the area to give tourists the experience of rafting in the Amazon basin – quite a different experience, by the way, from the whitewater rafting that is popular in the foothills of the nearby Andes in inflatable rafts. All the rafts observed exhibited strong similarities in their basic construction. 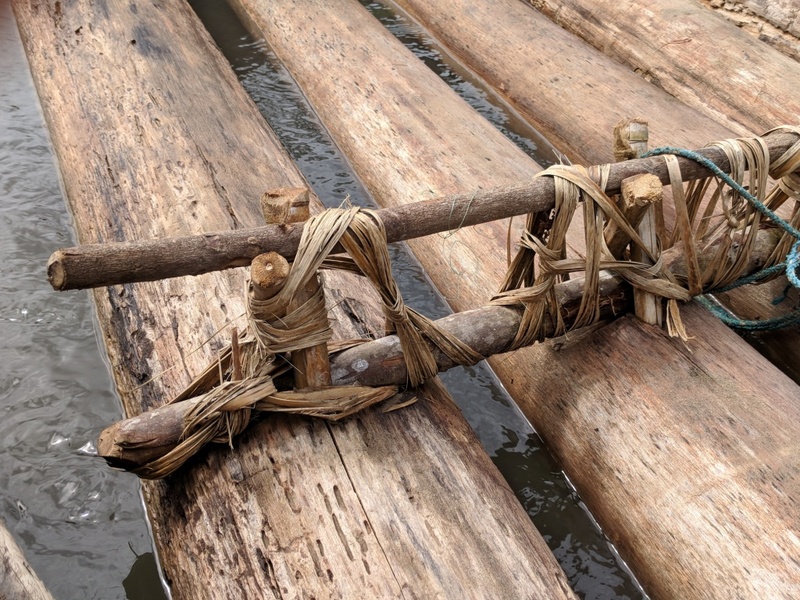 Their main logs were all bound together by two crossbeams locked in place by pegs driven obliquely into the tops of the main logs, and the crossbeams were lashed to the pegs. All had at least some of their main logs cut to a point in plan view at the (presumed) bow end for hydrodynamic efficiency. 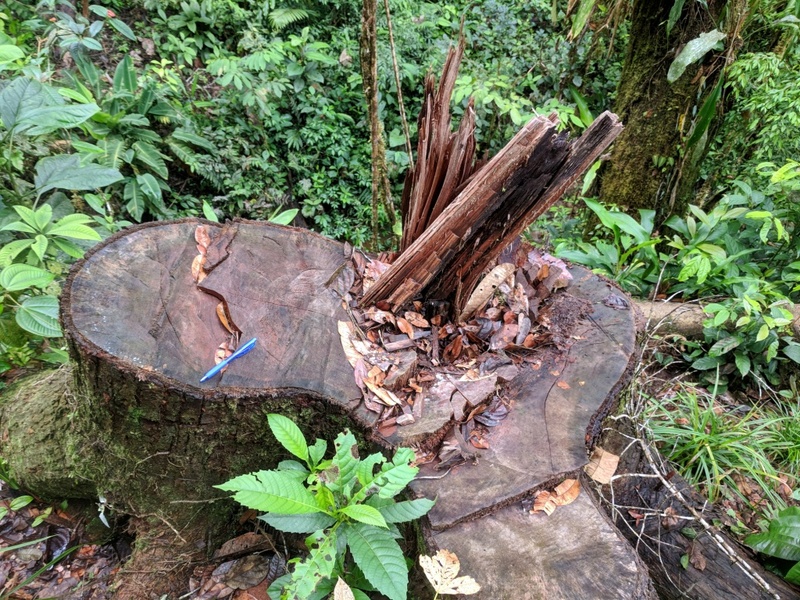 According to my guide, the main logs are typically balsa wood, although to my untutored view, they did not all appear to be of the same wood. I observed a push-pole on one of the rafts and presume this is the common method of propulsion, no paddles or other propulsive devices being seen. Beyond these similarities, though, the rafts exhibited distinctive differences that seem to indicate that the technology, while useful and surely rooted in tradition, is not rigidly bound by it. For example: the rafts were built of 3, 4, 5 or 6 logs – quite a range of variation in just six examples; some of the rafts had additional crossbeams above the crossed locking pegs – others did not; some of the pegs and crossbeams were milled lumber – others were not; and the lashing materials varied widely. The photos and captions below explore these similarities and differences in designs and construction. Each set of cross-beams consists of two beams, one atop the other, held in place and separated by pairs of pegs driven into the main logs in an X pattern. 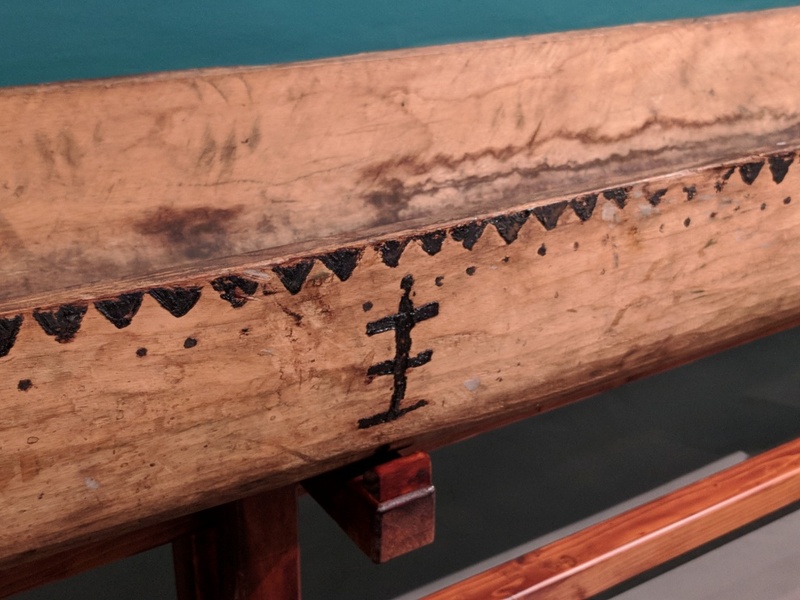 The beams and pegs are lashed together with what appear to be narrow palm leaves (possibly pandanus?). The upper crossbeam is lashed indirectly to the lower one, and not to the pegs. Its purpose may be to spread the upper legs of the X'd pegs, locking them into the main logs. Just forward of the forward crossbeam assembly is a pair of crossed pegs set in the top in the middle log. Their purpose is unknown: perhaps they were placed incorrectly and could not be easily removed. 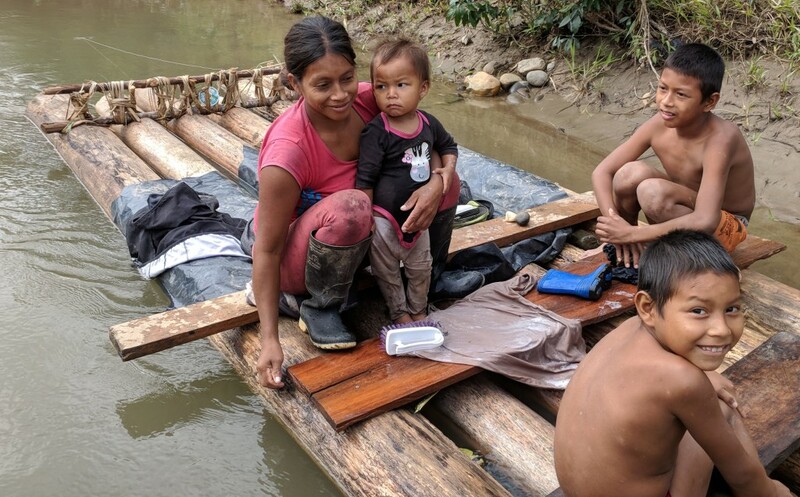 The informant doing laundry with her children on a six-log raft. Most of the logs are tapered in plan view at the front. The boy wearing red shorts is sitting on a bench whose legs extend between the logs. 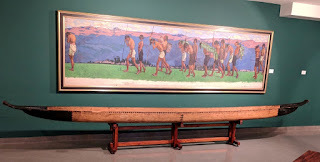 The bench is not fastened to the raft and probably does not represent a permanent part of its furniture. Lashing and peg arrangement of the forward cross-beam assembly. The lower crossbeam appears to be let into the upper surface of the outboard log. 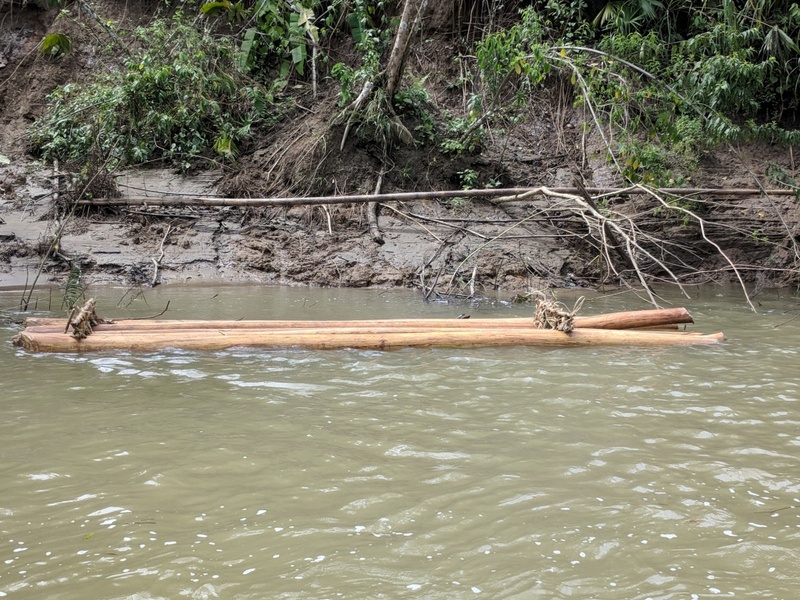 The cross-plank in front of the woman is nailed in to least one of the logs. It is unclear if the plank she is sitting on is fastened or loose. The lower aft crossbeam also appears to be let into the upper surface of the outboard main log. 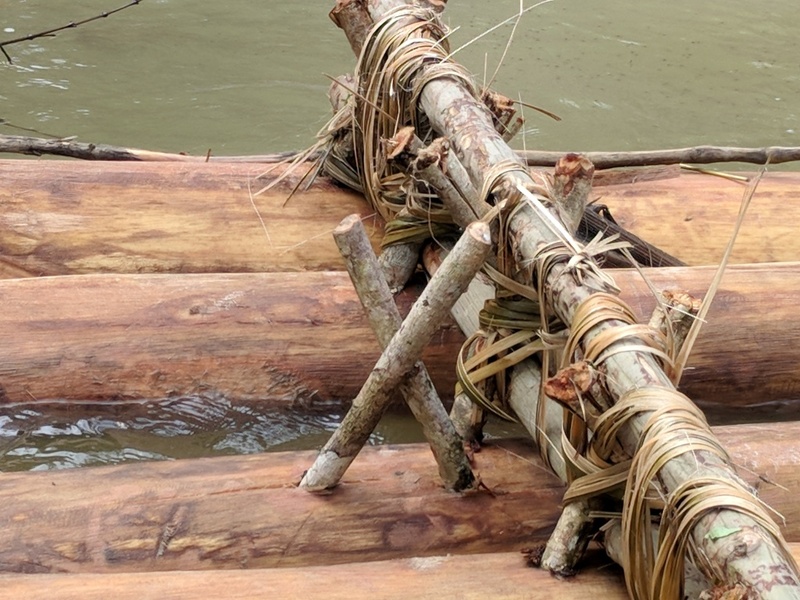 Unlike the previous rafts, the main logs on this 3-log raft are spaced away from each other, not adjacent. The outer logs are much larger in diameter than the central one and their bow ends are tapered both in plan view and from the bottom to the top for a true boat-bow shape. The smaller central log is only slightly tapered in plan view. The front crossbeam is a single beam. On the port log, it is secured by a single peg placed aft of it. The aft crossbeam assembly consists of two crossbeams, the upper one being a piece of recycled milled lumber. 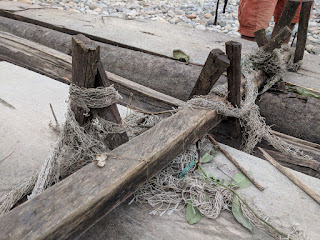 The port (foreground) lashing is old fishnet. The starboard lashing is a piece of insulated electrical wire. There are no lashings at the middle log. Forward of this assembly (to the left) is a piece of milled lumber nailed into all three logs and serving as an additional crossbeam. 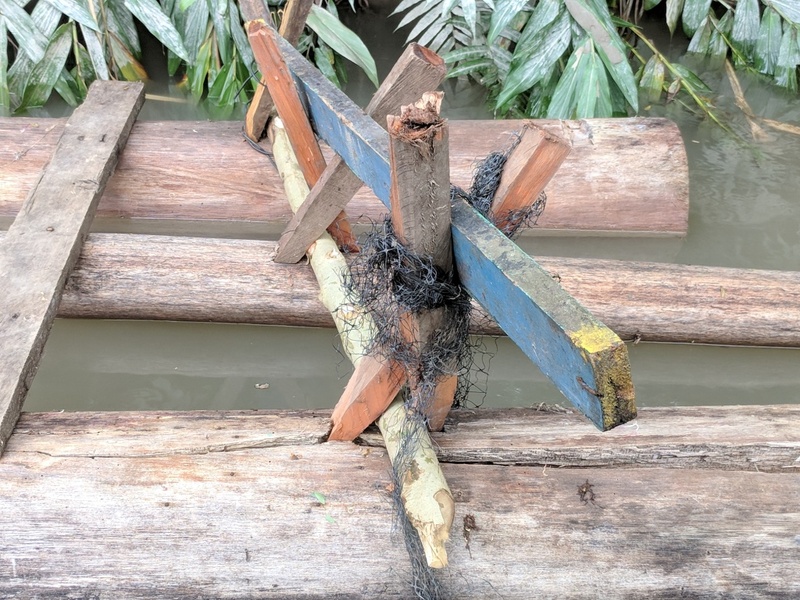 This four-log raft was found aground on a gravel bar in the middle of the Rio Napo, probably washed from its owner's shore front home by heavy rains a couple days previously. 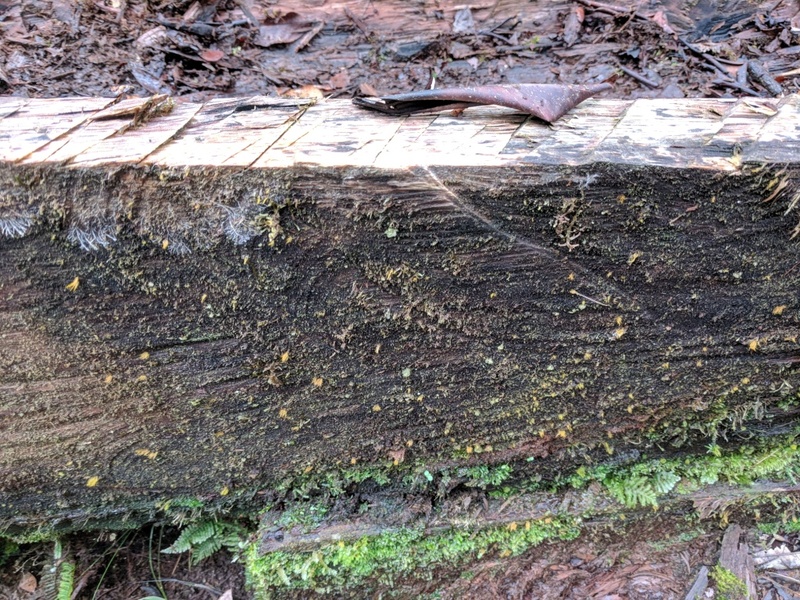 The logs are all adjacent, the outer ones being much larger in diameter than the inner ones and milled flat on their upper surfaces. The inner logs, however, extend somewhat further (but not equally so) than the outer ones. The ends of the outer logs are boat-shaped; the ends of the inner logs are square. At the opposite end, however, one of the inner logs is tapered to a boat shape while the other remains square. 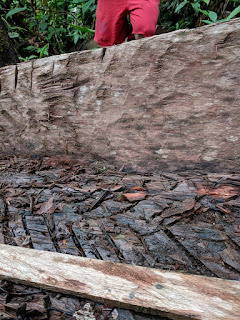 Both outer logs have notches cut in the upper edges of their tapered sections, probably to hold ropes which are no longer in evidence. 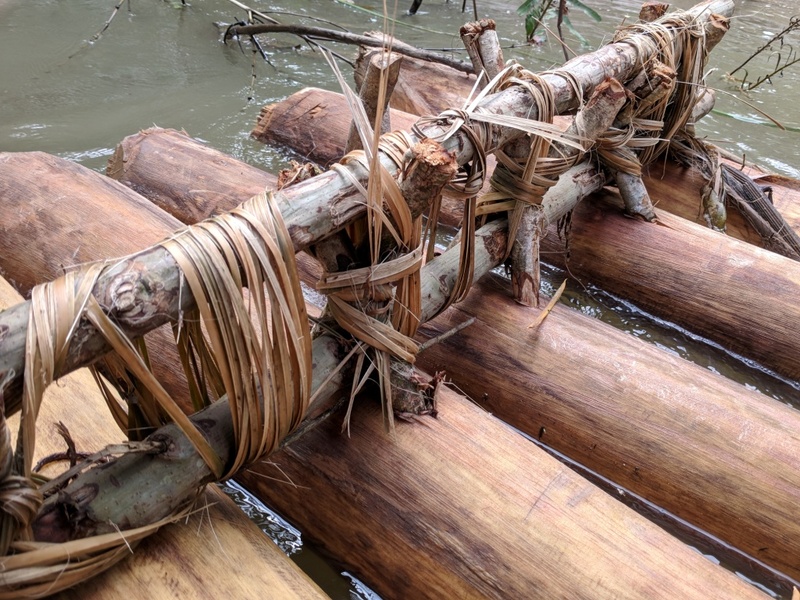 Perhaps the logs were previously used in another raft which was held together by lashing alone instead of the pegs-and-lashing method. The other crossbeam, also a single piece of milled lumber (but of different dimensions) is lashed carelessly with old fishnet. One of the pairs of pegs in an outer log (left foreground) does not enclose the crossbeam, providing support to the notion that the outer logs previously belonged to a different raft. End view of the same raft shows that the smaller, inner logs are set lower than the larger outer ones. In June, I went searching for logboats along a portion of the drainage of the Rio Napo in el Oriente -- that part of Ecuador that lies to the east of the Andes Mountains. The Napo and all other rivers here drain ultimately into the Amazon. On my first day in the forest, accompanied by a guide/translator and a driver, I explored the Rio Jatunyaco, a tributary of the Napo. In the dispersed rural community of Ichu Urku, I met Fernando Vargas-Tapuy. Like almost everyone in this area, Fernando is Kichwa (i.e., Quichua). 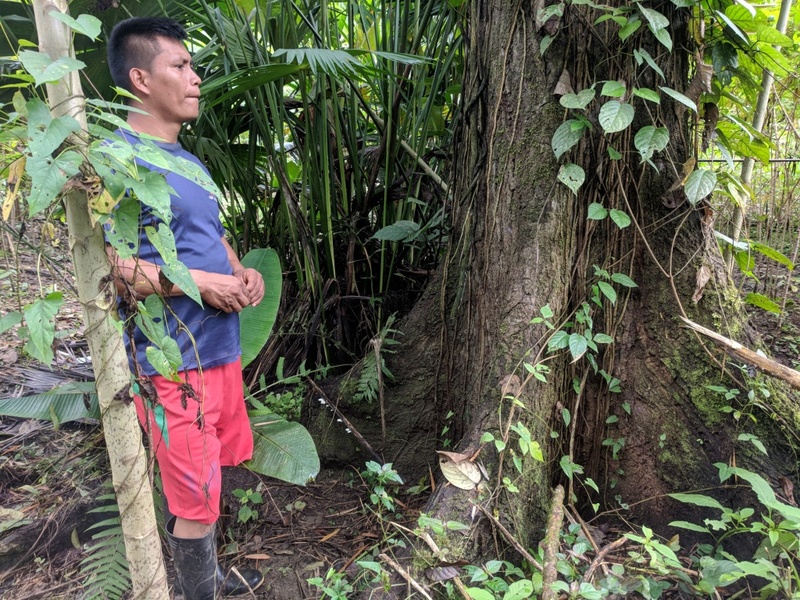 He lives with his wife and toddler daughter on a small farm where they grow cacao, maize, yuca, plantain, and guava, consuming 5-10% of it and selling the surplus in the nearby city of Tena. 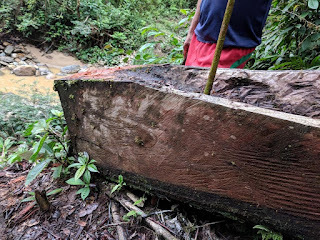 He also pans for gold in the Rio Yucho Pino (in spite of the "rio" in its name, this tributary of the Jatunyaco is really just a mountain stream), typically collecting 1.0 to 1.5 grams in a day of work. Fernando's farm has no electricity, but he does have mobile phone coverage. 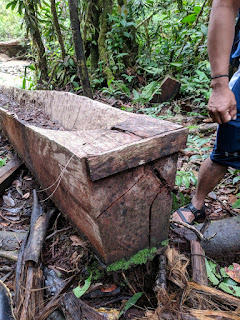 Fernando told my guide that with the help of an uncle, he was building a dugout canoe nearby, and he was willing to take us there to see it. With Fernando leading, we walked through his farm, across muddy fields, then up a slick, narrow, steep path over a low mountain. Although the sun was overcast, the humidity was oppressive, and the 40- minute walk proved to be the hardest hike I have ever done. 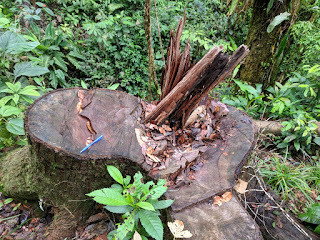 At one point, Fernando stopped to cut me a walking stick with his machete. This helped a great deal, especially when crossing and recrossing the rocky Rio Yucho Pino several times. 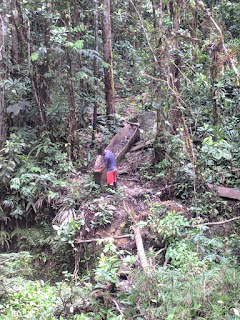 Fernando at the canoe building site, high on the side of a steep hill. High on the mountain we came to the canoe building site. 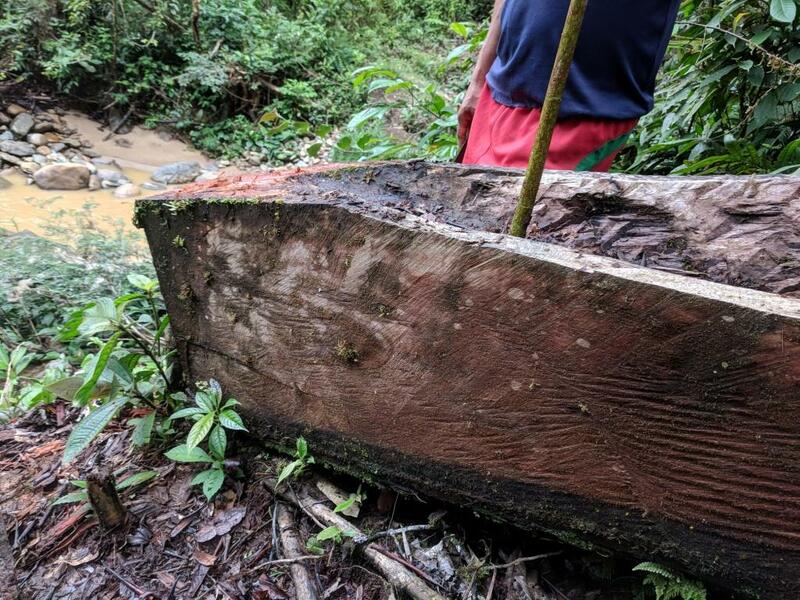 The canoe was being carved where the trunk had been felled, on a fairly steep slope. At first sight, it looked abandoned, for it was full of sodden wood chips and partially covered in fungus. 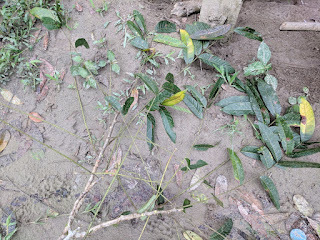 In fact, it was being actively worked, but the environment is so moist, and fungus grows so rapidly there, that a pause of just a few days suffices to give rise to a substantial crop. The canoe had been under construction since April and, working with his uncle, Fernando expected to finish it in June. It would not be moved, however, until the flow in the Rio Yucho Pino went down. 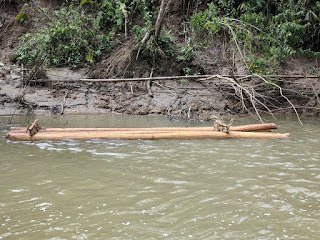 Too steep to paddle, the Yucho Pino represents an impediment, not a canoe corridor, until it dries out. 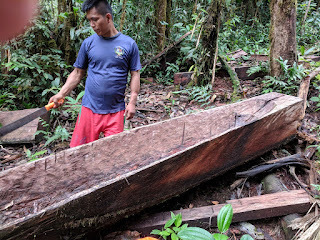 When it does, Fernando will call for a minga -- a Kichwa tradition in which the people of a community work together in a system of shared obligations. Approximately a dozen men will help carry the boat down the mountain and to the river, a process that will take about two days. Fernando will provide food and or drink to his helpers, but no payment. What is expected is Fernando's participation the next time a neighbor calls a minga. Fernando plans to use the canoe to transport his produce to Tena and to bring his daughter to school when she is old enough. He says he will paddle it himself and not fit it with an outboard engine. With more than three people aboard or a heavy cargo, more than one paddler would be required. 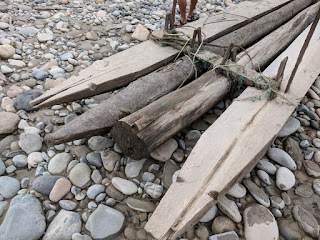 Based on observations of other canoeists nearby, I believe the canoe will also be poled as often as it is paddled, although I did not discuss this with Fernando. 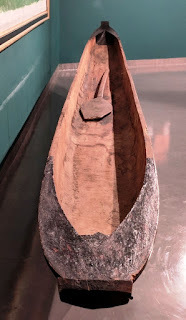 The canoe measures 7.50 meters LOA and 61cm beam. 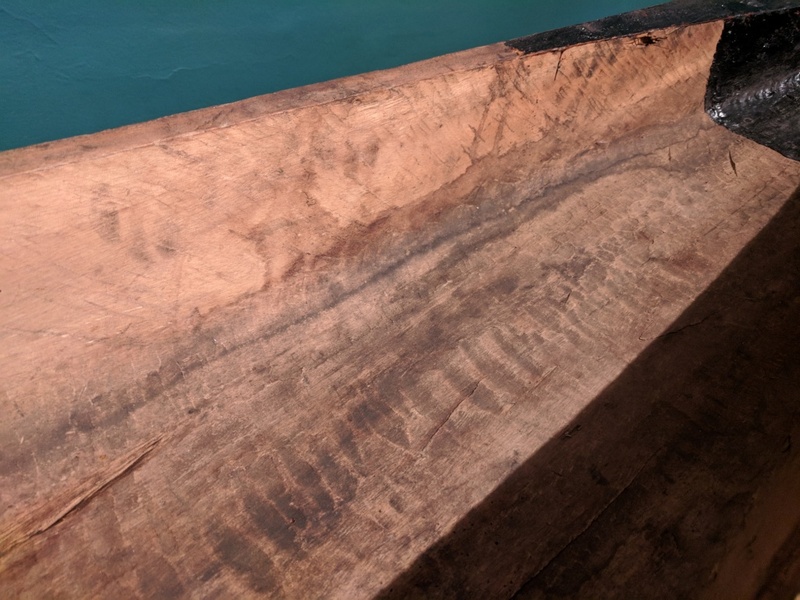 It is roughly 36 cm from the exterior bottom to the top of the gunwale and 25cm deep on the interior, but according to the builder, the bottom will be hollowed another 5cm or so, for a final interior depth of about 30cm and a bottom thickness of about 6cm. The sides are 27mm thick at the sheer. Fungus growth is apparent on the exterior. Rough exterior shaping was done with a chainsaw, tool marks of which are visible. 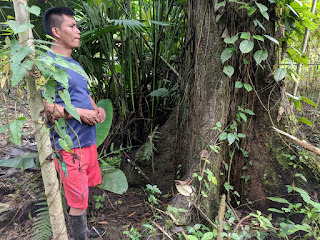 A chunchu tree on Fernando's farm -- not nearly as large in girth as the tree he and his uncle cut on the mountain for the canoe. Leaves and branches of a chunchu. After initial shaping with a chainsaw, the canoe is slab-sided with angular ends. The forefoot will be cut back later for an easier entry, and the square chines will be relieved for a round bottom. 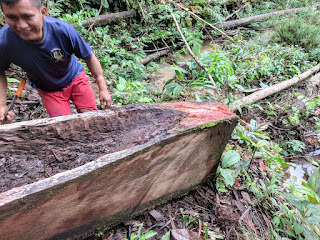 Fernando took a few swipes with his machete near the top of the bow to show that the red-colored wood was sound beneath the covering of fungus. Another view of the rough-cut bow. A seat for the paddler is carved into the stern just forward of the aft platform. 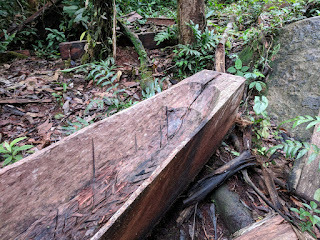 This feature is typical of the canoes on the upper Napo drainage. 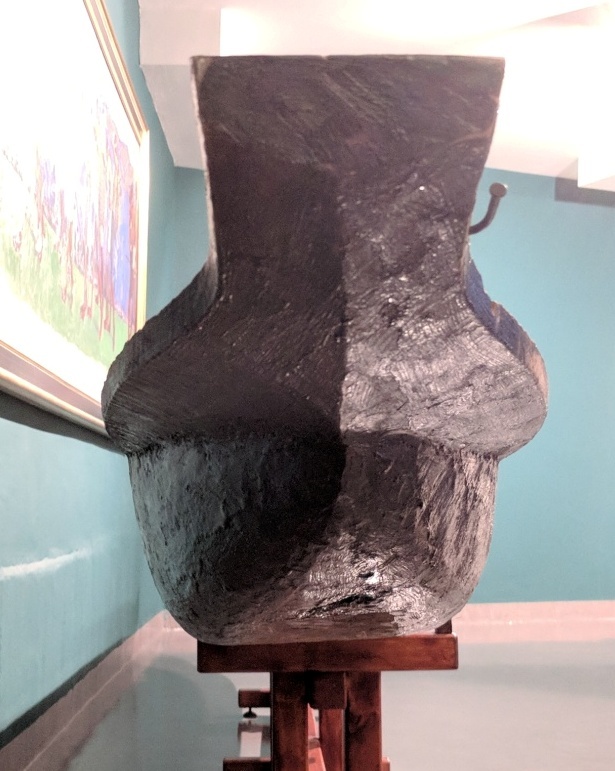 A more complete view of the stern. From the cross-hatch marks in the bottom interior, it appears that gross material removal was performed with a chainsaw, although I did not confirm this with the builder. 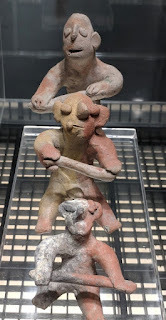 Later shaping was done with an axe and two-handed and one-hand adzes, marks of which are clearly visible on the sides. 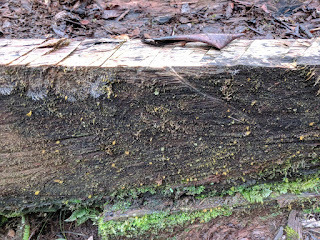 The end of the trunk split when the tree was felled. 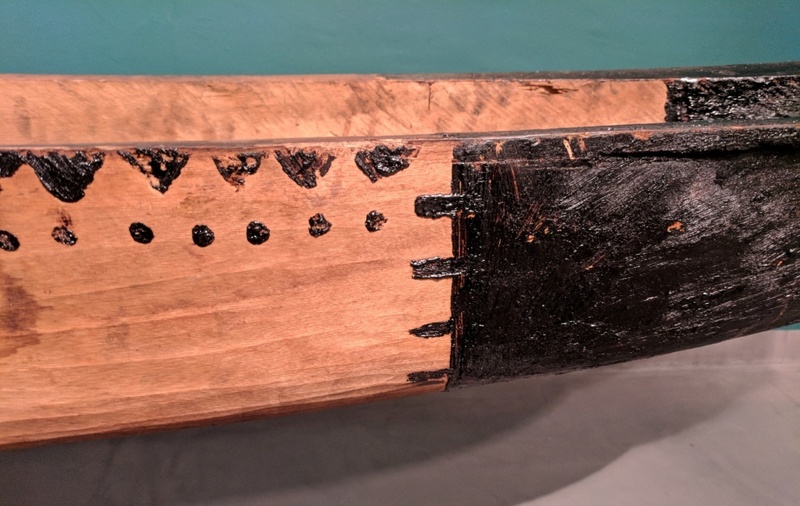 A cleat was nailed across the transom to prevent the split from spreading further. 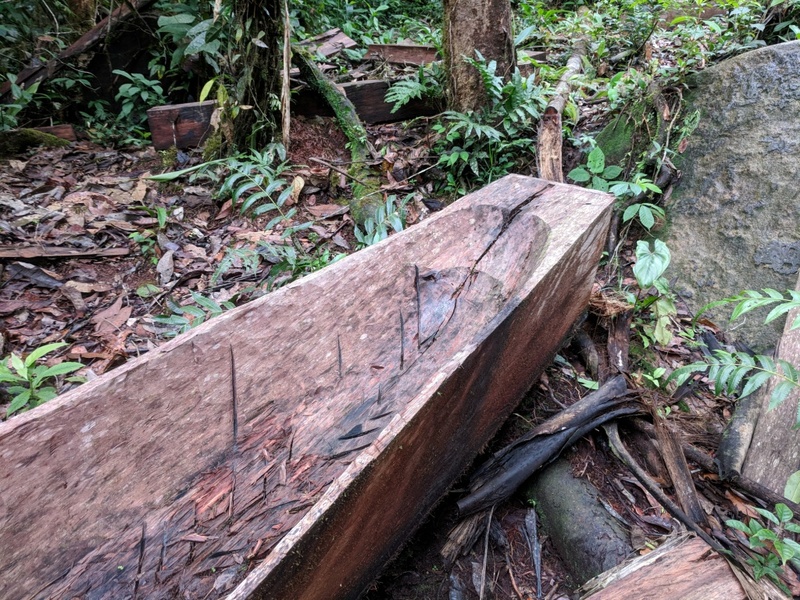 A large percentage of the dugouts I saw in this area were split at the stern, with heavy wire more typically used to prevent further splitting. 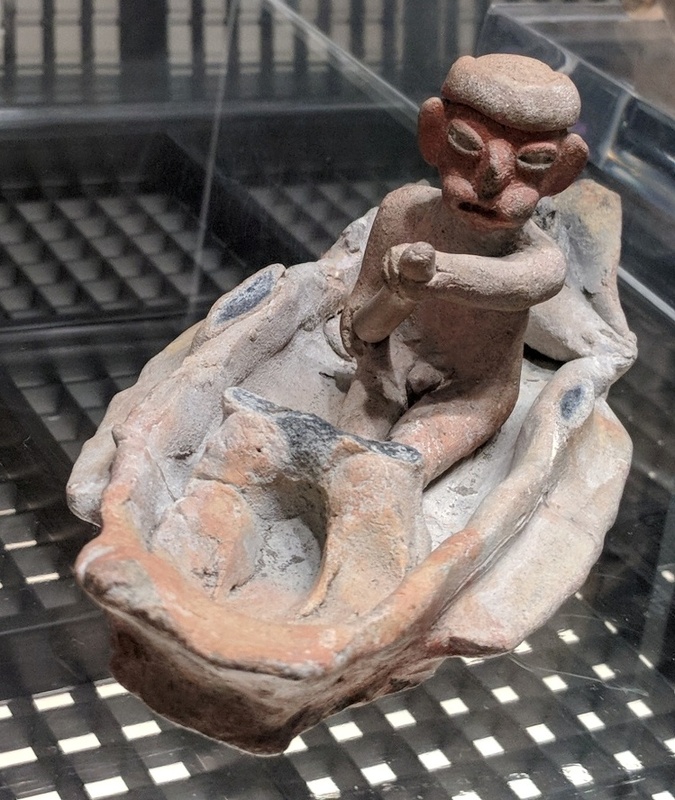 Artifacts on display at the newly renovated National Museum of Ecuador in Quito demonstrate the importance of watercraft to Ecuador’s prehispanic populations and illustrate some of the ways in which they were used. The bulging cheeks show that the paddlers are chewing coca leaves. Since coca is not native to Ecuador’s coast, this suggests regular trade between the coast and the Andes or even the Amazon. 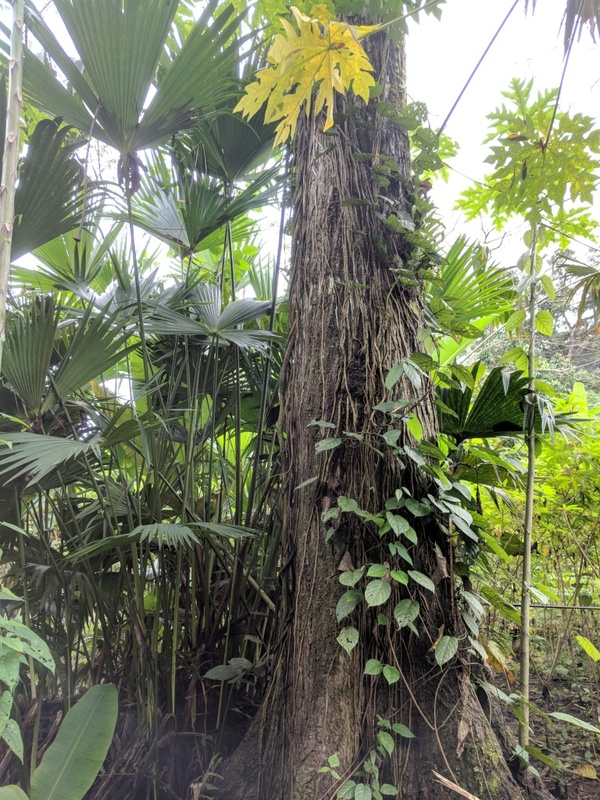 And because the medicinal effects of coca at countering altitude sickness are irrelevant on the coast, it may indicate that even common people – not just shamans – used coca for its stimulant/hallucinogenic effects. A Tolita paddler in his ceramic canoe. Unlike the previous paddlers, who sat with their legs spread, this one sits with his legs together. 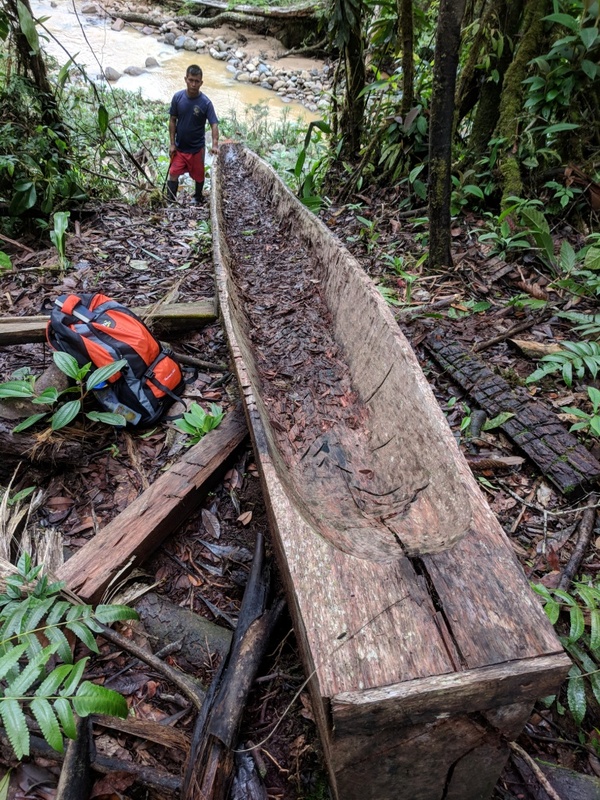 Behind him are the remains of a second paddler with his legs spread to clear the first one’s hips, while in the bow are the feet of an otherwise missing standing or squatting passenger or high-status individual. The modeling of the complete paddler is more sophisticated than in the previous photos. The canoe has stabilizer boards attached to both sides, at or just above the waterline. 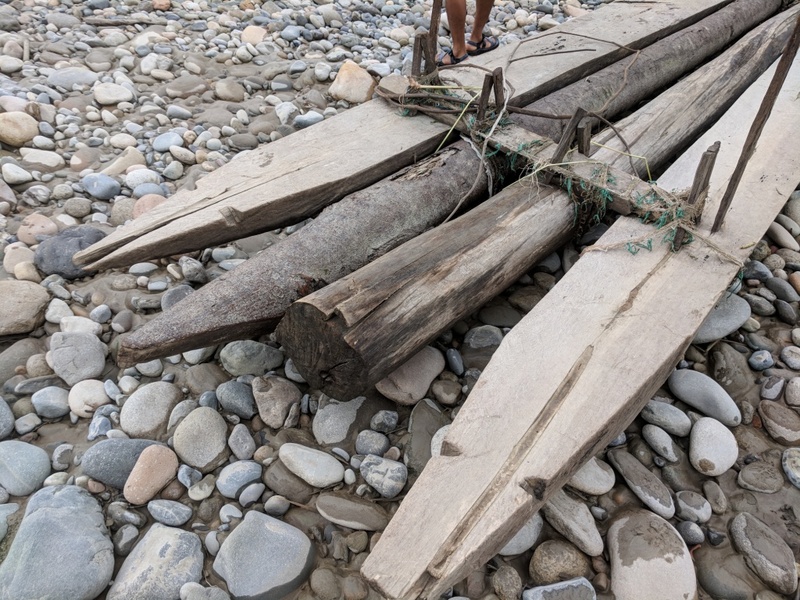 In case of a sudden loss of balance, these boards would provide some resistance to further tipping and give the paddlers a precious moment in which to apply bracing strokes to prevent a capsize. The item, from the Jama Coaque culture (350 BCE – 1532 CE) is identified on the exhibit card as a “paddler attached to a vessel” (Remero adosado a recipiente). 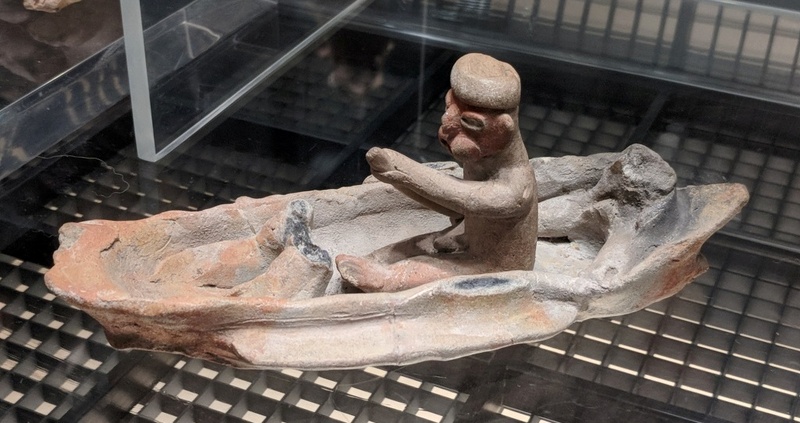 I question the identification and suggest that the figure represents a warrior, not a paddler, as the item he holds looks more like a spear than a paddle to my eyes, and I have not seen the kneeling posture in other prehispanic depictions of Ecuadorian canoeists. The figure’s attachment to a drinking vessel strongly suggests ritual usage, which is not surprising for a warrior figure, somewhat more so for that of a canoeist. If the figure does indeed represent a paddler, this places canoeists at a high level of social significance. 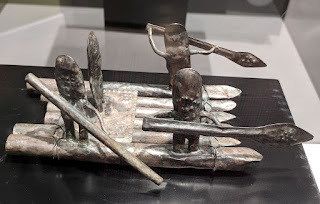 A model raft in silver from the Bahia culture (500 BCE to 650 CE), manned by two paddlers, a steersman, and an individual of high status. The logs are lashed together with silver wire. 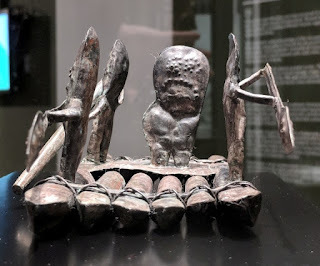 The figures are severely flattened sagitally, meant to be viewed only frontally, regardless of their orientation on the raft. The longer logs are outboard and shorter ones inboard, counter to common practice of Ecuador’s later Manteño culture (500-1532 CE) and of many other raft-building cultures around the world, in which longer logs tend to be placed closer to the centerline, giving the raft a pointed bow (and sometimes stern as well). 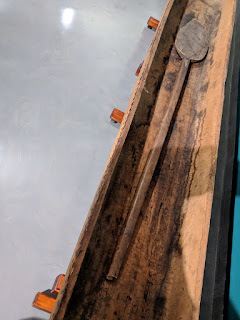 Tools used by the Manteño culture to collect thorny oysters (Spondylus). 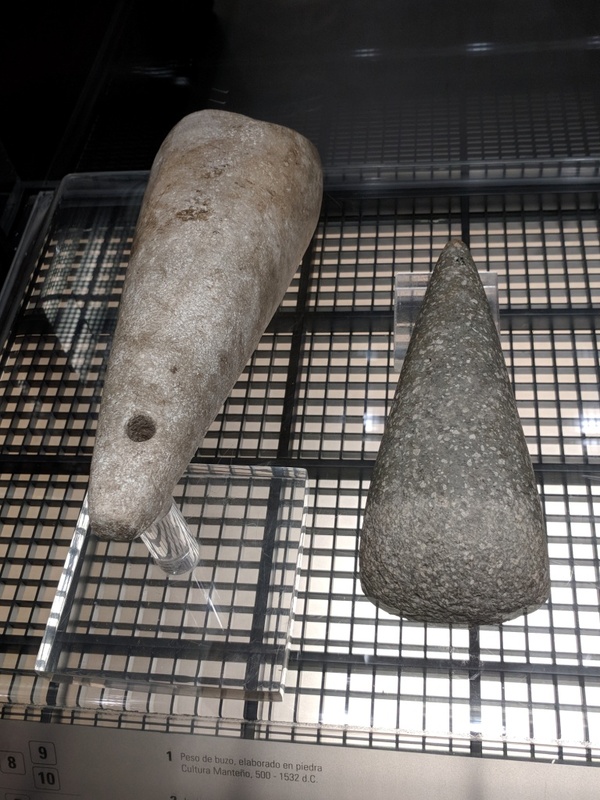 On the left is a weight used by divers to enable them to descend rapidly to the depth where spondylus are found. 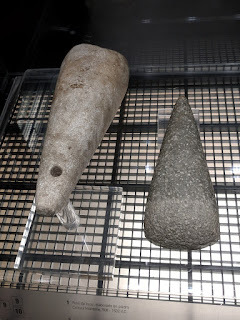 On the right is a chisel used to loosen the mollusks from the rocks to which they attach themselves. 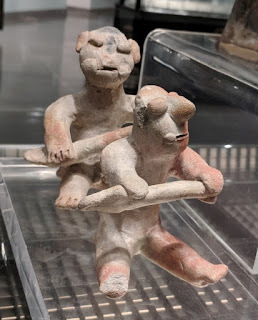 Spondylus was important to many of Ecuador’s prehispanic coastal cultures for its spiritual symbolism, for the production of jewelry and other ornaments, and as an item of exchange. 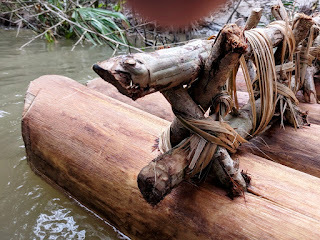 A fish's-eye depiction of diving for spondylus from a three-log raft using tools like those in the previous photo. 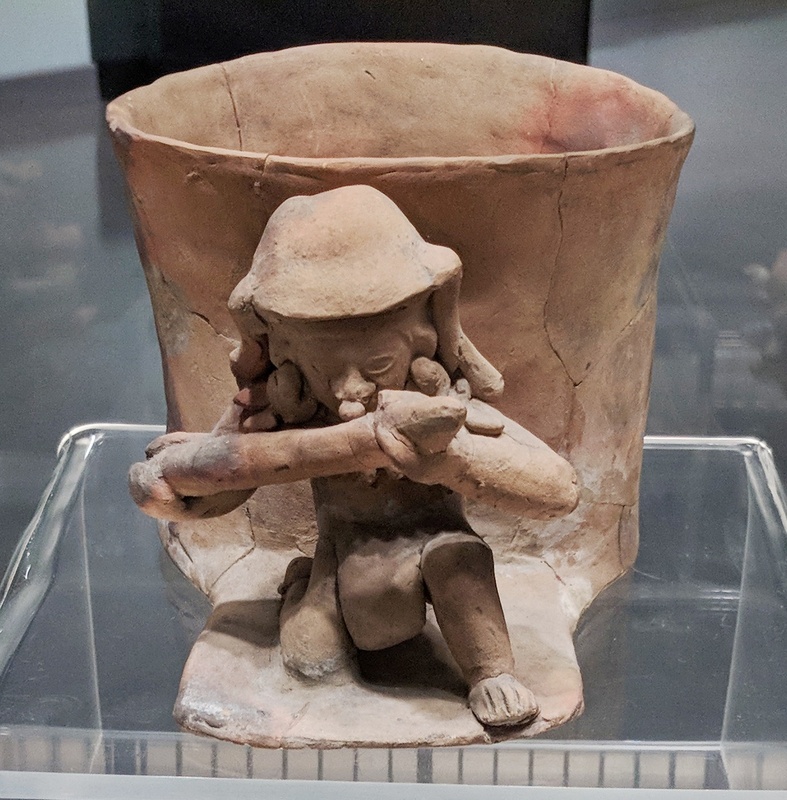 Following a two-year closure caused by money problems and the need for extensive renovation, the National Museum of Ecuador at La Casa de Cultura in Quito reopened last Saturday. The essentially new museum is attractive, sophisticated, and free. In the current fashion of most museums, this one takes pains to tell stories. Artifacts are displayed in service of narratives constructed by the curators (and, one suspects, by the museum's board of directors and management). This means that one might not find an extensive display of items from a particular culture or artistic movement all in one place. 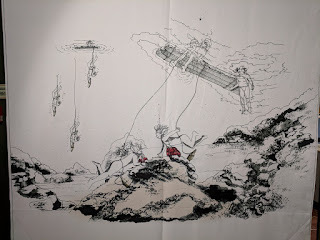 Instead, one or a few such items might appear in a conceptually linear display with different types of items from different eras, movements, or cultures, in order to illustrate, for example, the evolution of a national identity, art movement, or economy, the widespread effects of colonialism, racism, or nationalism, or some other major theme. In terms of public education and opinion-shaping, this is probably a good approach, but for visitors interested in a particular, narrow subject, it can be disappointing or frustrating. Count me in the latter group, even while I acknowledge that the museum is a fine one and well worth a visit. I was there on opening day (ticket #36) and went searching for boat-related content. 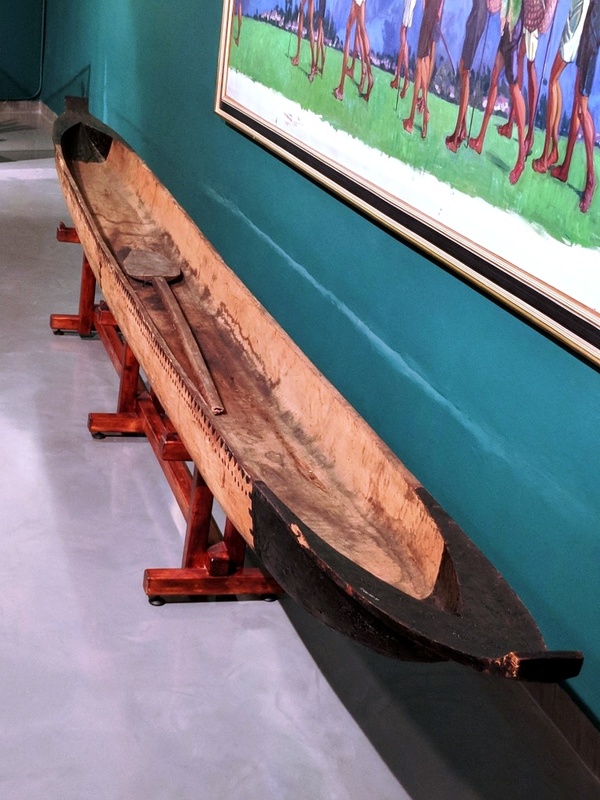 In this post we'll look at one notable item, a beautiful 20th century logboat (i.e., dugout canoe) of the Shuar people of Ecuador's Amazonian region, on loan from Museo Pumapungo in Cuenca, Ecuador. 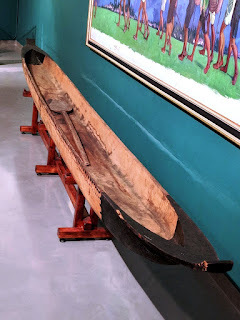 (We posted previously about another Shuar logboat of a different design on display in Quito.) As always, click any image to enlarge it. The sides are straight and parallel. The ends are virtually identical, leading to square-ended extensions or platforms. The interior sections are rather square. Sides and bottom are flat and at very close to right angles. The sides are about 7/8" thick at the sheer. The bottom is roughly 1.5" - 1.75" thick. The platforms/extensions are fairly narrow, rising out of thickened "gunwales" near the ends. A slight ridge appears on the underside of the platform. The exterior of the hull shows rounded chines and a flat bottom. A single bent nail appears sticking out to the right of the end extension/platform. It does not appear to be robust enough to serve as a tying-off point. Might it be a guide for a fishing line? Even while the sides and bottom retain a sharp angle between them, the interior hollowing tapers and rises to a sharp point, leaving a large amount of timber intact at the ends. This visually appealing feature probably helps the hull resist cracking. 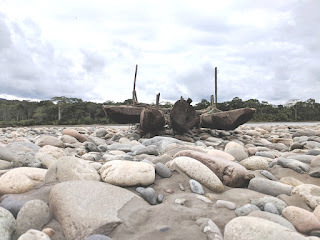 The boat was hollowed out using an adze, marks from which are clearly visible. Applied decoration near one end does not appear to be paint. Perhaps it is derived from a plant resin (?). Decoration near midships. 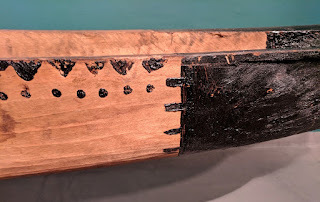 Ax and/or adze marks can be seen on the exterior of the hull. 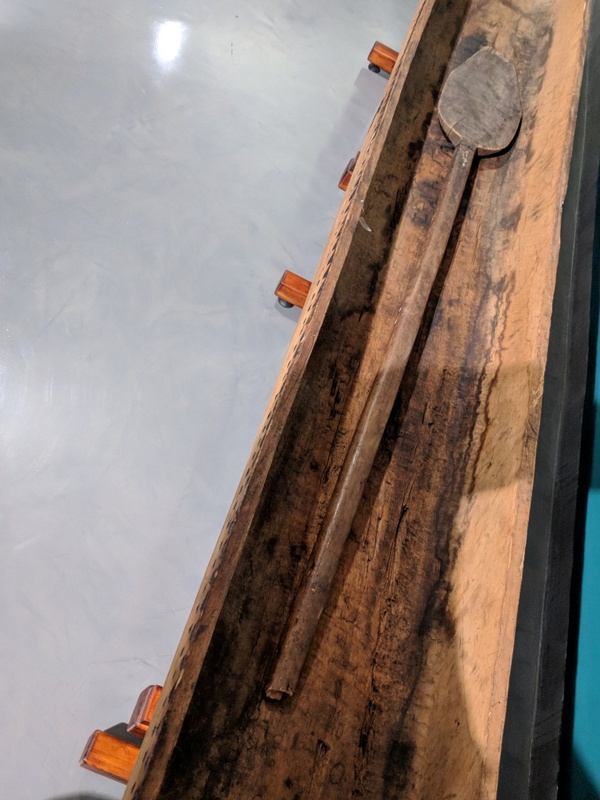 The paddle is about 5'6" long, but the upper end of the shaft is missing, along with any end-grip that may have existed (unlikely). The shaft and blade are carved from the whole. The shaft is flat on its front and back surfaces, but the sides are rounded and the edges are relieved. The blade has wide shoulders and tapers toward a broadly rounded tip. Note to Networked Blogs subscribers: Networked Blogs has discontinued its service. Please select another subscription method (right column, near top in desktop view) to continue receiving posts from Indigenous Boats automatically. 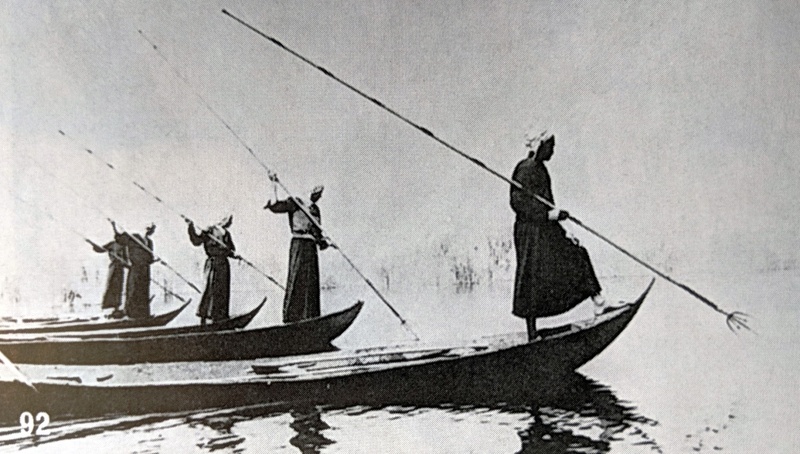 In the prior post we examined the watercraft of the Madan or Marsh Arabs. Now we'll look at how the Madan used those boats -- particularly the plank-built ones. 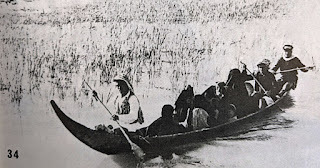 As in the last post, all the photos and essentially all the content are from The Marsh Arabs by Wilfred Thesiger. Almost all of the economic activities of the Madan depended upon their boats. The most important were raising buffaloes, fishing, wildfowling, reed cutting, mat-making, and smuggling. Others included raising sheep and goats and growing wheat, barley, and rice. Some entire communities specialized in boat building. 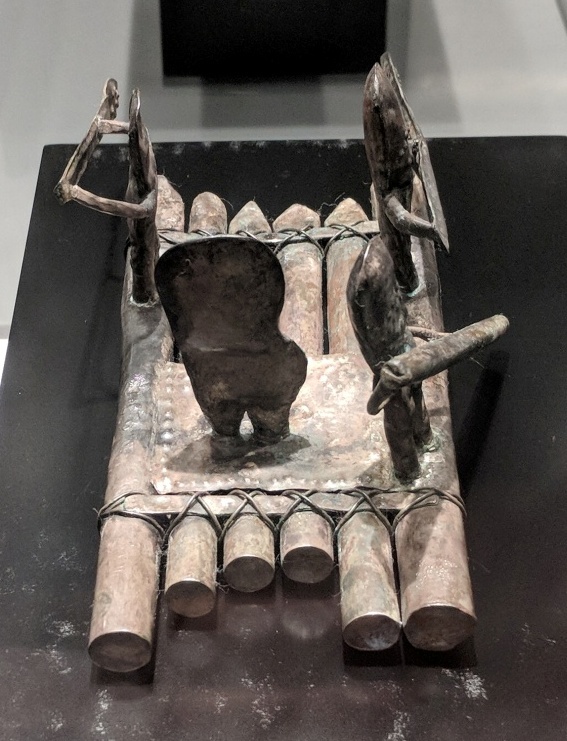 Although the Madan, as devout Moslems, do not eat pig, they frequently mounted hunting expeditions in which several boatloads of men would go after the wild pig that abounded in the marshes and played havoc with their crops. Some of the hunting may have been done for the pure sport of it, however. Boats congregating in great numbers on market days. 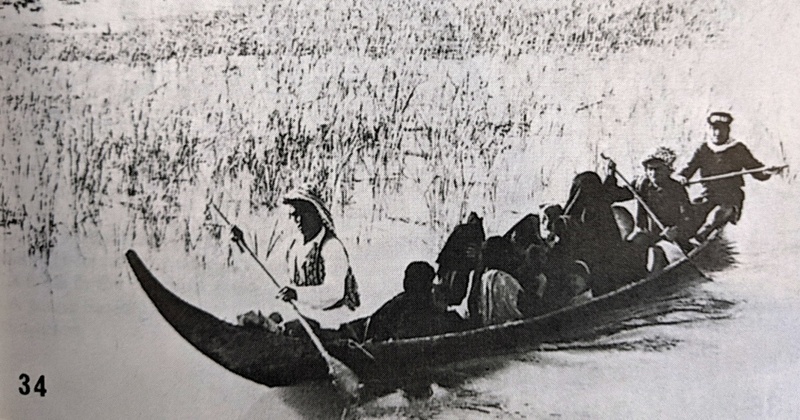 Aside from economic uses, virtually every aspect of life in the marshes depended upon boats. All visits to other villages, for courting, weddings, funerals, the prosecution of feuds, visits by itinerant circumcisers, etc., were made by boat. 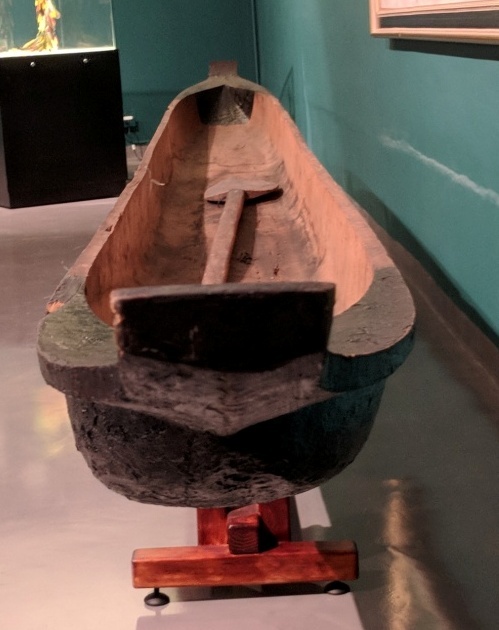 As few of the reed islands or marsh dwellers had privies, the call of nature was often answered by hopping into a canoe, paddling a short way off, and squatting over the side. Drinking water, by the way, was drawn from the same source. Even with full load of passengers, there are still several inches of freeboard on this balam. Three men are paddling: one in the bow, and two (on opposite sides) in the stern. As a social convention, it was customary for a man in boat to greet a man on shore first, rather than the reverse, and for boats traveling downstream to issue the first greeting to those traveling upstream. Perhaps the first of these traditions arose because a person traveling was more likely to have news for one at home than vice-versa, or that a stranger passing by one’s home was viewed as a potential threat, so it behooved the boatman to be the first to express good intentions. As to the second tradition, perhaps those traveling downstream were assumed to be coming from home, while those traveling upstream were returning from market. News from home might have been valued more highly than news from the city. These are just speculations. 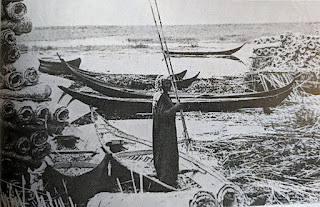 Fishing, much of it done from boats, was the primary economic activity of many individuals and tribes in the marshes, and an important secondary one for others. Some fished on a subsistence basis, while others caught fish for market. The most common catch seems to have been different species of barbel, some of which are types of catfish, others being related to them. Several fishing methods were used, including spearing, netting, and poisoning. Also noodling – more on that in a bit. Fish poisoning was done in winter and early spring, before the water began to rise. 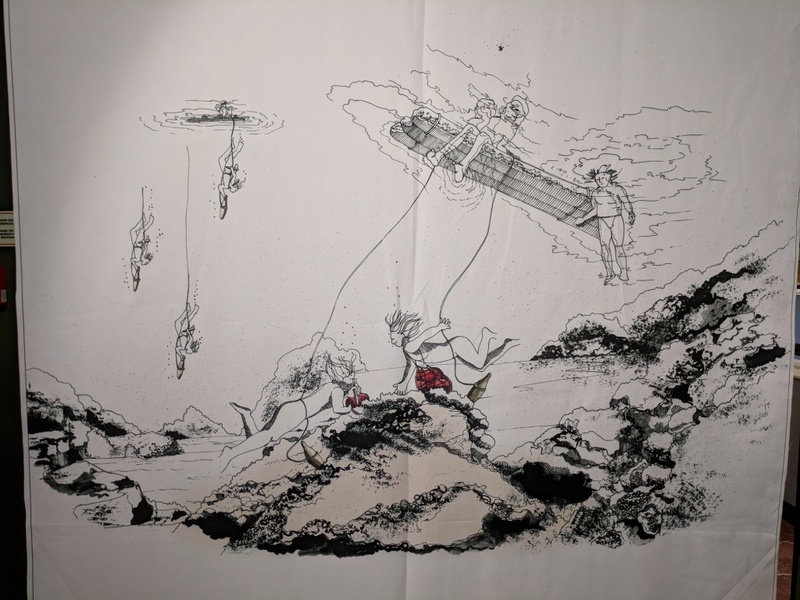 Datura, a poison derived from a genus of plants of the same name, was purchased from local merchants, mixed with flour and chicken droppings or inserted into freshwater shrimps which were cast upon calm stretches of water. Fish ate the bait and were stupefied by the datura, causing them to float to the surface where they could be easily collected. This was a more productive method of fishing than spearing. Noodling (a Southern United States term for catching catfish by hand) was also practiced, particularly for a large fish called gessan, which was probably a type of barbel. Gessan would shelter beneath floating islands of reeds, where they were safe from spear and net. They were targeted by teams of two men in a canoe. One man stayed in the boat while the other dove beneath the island with a rope tied around his leg. 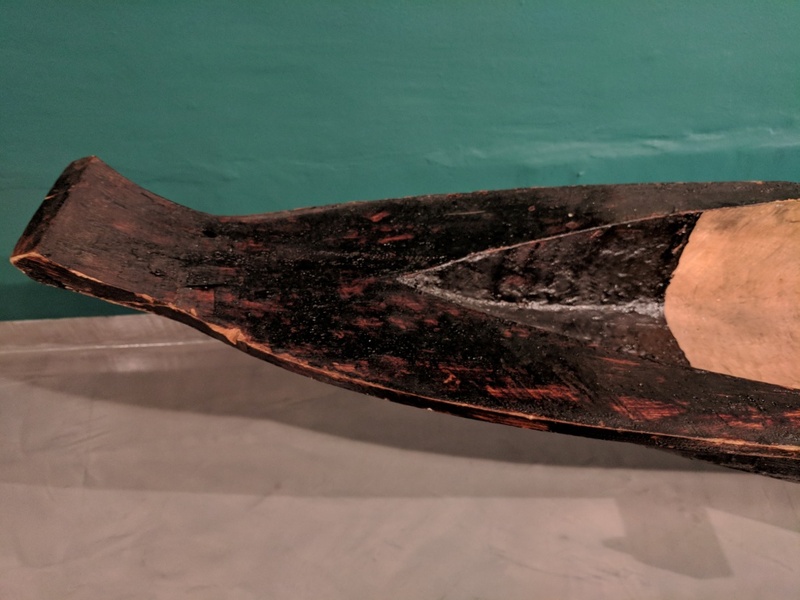 The swimmer would grab the fish (probably by the gills, if Southern practice is an indication) and be pulled back out by the man in the canoe. This was changing however, and Madan were beginning to sell both fish and buffalo milk, which they previously had not done, instead keeping both commodities solely for their own use. 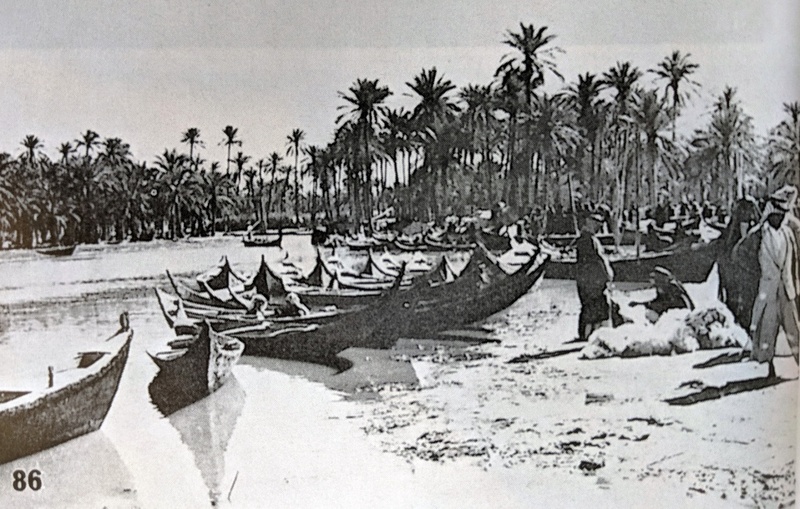 Thus, when Thesiger visited, the Madan’s stated basis for their prejudice was in the process of shifting away from the occupation itself to the Berberas’ different method of fishing. Madan fishing with spears, their boats proceeding in line abreast to herd fish before them. One man paddles in the stern in each canoe. During the height of fishing season, hundreds of boats might work a single lake at once. 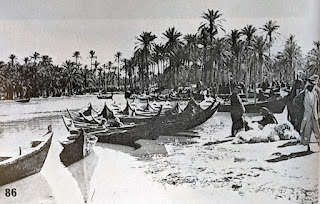 Merchants would set up buying stations on the shore, buying boatloads of fish, packing them in ice, and sending them by truck to Baghdad. (Fish were also salted.) 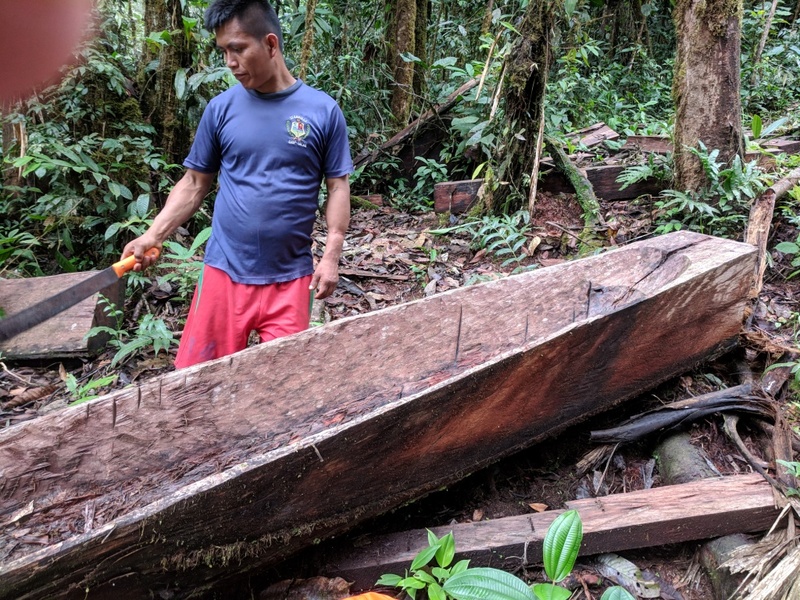 There was fierce competition between groups employing spearing and netting methods, racing each other to the next favored spot and intentionally blocking each other’s access. 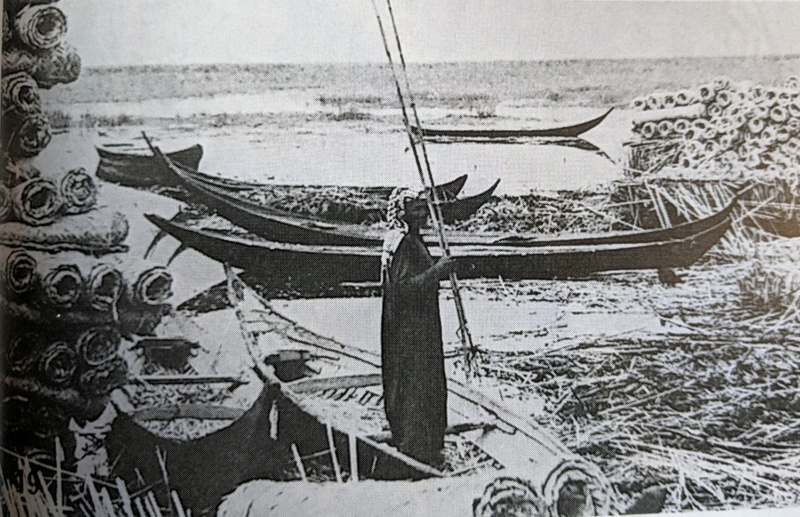 Thesiger even described spearmen poaching a seine net already full of fish and in the process of being drawn in. This would seem to be strong evidence of the superiority of net fishing, but the spear-wielding Madan evidently didn’t see it that way.